Its functionality can be compatible with most Android, IOS and Windows devices, but the Bluetooth feature may be limited to IOS devices because it is based on Android. Function with Airplay, Miracast and Eshare features of IOS, Android and Windows devices, if you have any questions, contact our aftermarket experts for help. The future of portable Android projector technology is here now. 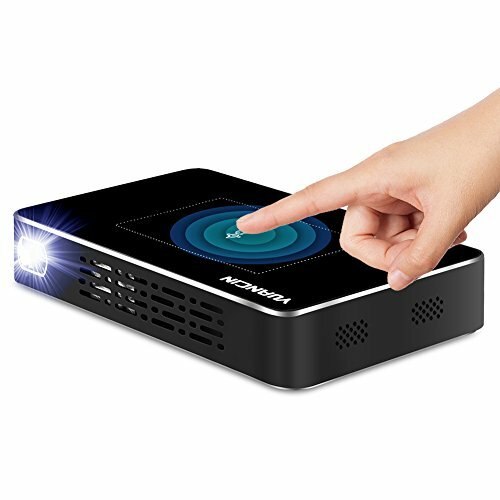 Mini portable smart projector, showing the latest viral video to your friends or Family and Kids, displaying your vacation photos on your living room wall, or simply watching a movie while snuggling in your bed, now becomes a breeze. It has a powerful internal battery capacity of 5400 Mah, which can play for 3 hours without stopping. Have a high-definition 1080P super bright screen. Built-in dual Wi-Fi and Bluetooth. Features HDMI INPUT only 4k display. The feature has a vertical keystone correction of 45 degrees. Features Miracast Airplay and Eshare features. Alloy metal shell and external laptop touchpad,built-in 1A Power bank,With size as your palm of 137*82*24mm, easily placing in pocket , you can get 200 inches screen images for outdoor activities or parties, just enjoy your time. Other Excellent Feature:Share screen with your smart phone via Airplay or screen-sharing function for share your documents and games on a big screen display and can also act as a Smart TV Box. If you have any questions about this product by Yuancin, contact us by completing and submitting the form below. If you are looking for a specif part number, please include it with your message.